Albert reveals that Cooper's unstable former partner, Windom Earle, has escaped from the mental hosptial where he was being held. Donna's first outing as a meals-on-wheels volunteer results in an unnerving encounter. Audrey's investigation at One Eyed Jacks becomes increasingly perilous as she uncovers secrets about Laura's time there. Later, James, Maddy and Donna record a, uh... song. Bonus Stuff: A Blue Rose by Silver Strain is a hallucinogenic musical and visual tribute to the show. Includes some pretty major spoilers for those who are on their first viewing. Just You and I by James Hurley is a hallucinogenic musical and visual tribute to love. "Is this real Ben? Or some strange and twisted dream?" I go back and forth on whether or not I like Windom, but he enters the picture here regardless. I can't help but feel the actual introduction of his character is sort of a let-down given the preamble with Albert and Major Briggs. We also get perhaps the strangest (meaning awkward) scene of the whole series with the late-night jam sesh. James has studio mics? He sings like Ned Flanders screams? Also the look on the girls' faces seems more like 'I'm only doing this because you're hunky, you big dingus' and less like 'this is a fun and productive use of my time'. I never noticed it before, but the child magician demon is David Lynch's son! Man, what a creepy and surreal scene. It becomes even more-so once you watch Firewalk. Ugh. Harold Smith. Of the second season's many misfires, he is my least favorite -- in part because the "creepy recluse who grows orchids and keeps people's secrets" feels like something out of a different, and worse, soap opera, in part because Lenny Von Dohlen's twitchiness feels very much like an acting school affectation. But, as I said in an earlier thread, I love the Tremonds. The Tremonds are everything Twin Peaks should be, and Harold is everything it shouldn't be, and so naturally the Tremonds make it into the film and Harold doesn't, even though Laura is supposed to have spent time with him in her last week. I was just about to comment on the crazy resemblance between magic-boy and our director. I agree, the amazing disappearing/reappearing creamed corn makes a lot more sense in light of what we later learn in FWWM. Mrs. Tremond's comments about the awful-looking hospital food from the previous episode makes me wonder if it too has some unknown metaphysical properties. I also wonder if this means that the TP Meals On Wheels program is actually something a bit more sinister. Where does Norma get her creamed corn from? I take back what I said about Bobby not being such a creepazoid anymore, because I'd forgotten that he and Shelly end up running an insurance scam using Zombie Leo. I continue to be uneasy with the newly cartoonish turn that they've taken with Andy. Maybe it's just the residual confusion with regards to his uncertain baby-daddy status that's turned him into a live-action Goofy. I'll be interested to track it as this storyline progresses. Whatever anyone thinks of the living-room musical sequence, I'm just heartened to know that rock music (in some form) has finally taken hold in Twin Peaks, with James Hurley as the new voice of adolescent rebellion in this tiny town. Parents, lock up your daughters! Because they will probably be murdered by a bodiless psychopath. Speaking of which, easily the image of the episode is BOB's full-on slink across the room and over the couch and RIGHT INTO YOUR FACE. It gets me every single time. From what I remember, Andy just keeps going downhill. The S2 arc that he gets is very, very not good. I don't know why I didn't put it together until now, but David Patrick Kelly, the actor who plays Jerry Horne, is also the same guy who played Luther in The Warriors. You know, the guy with the bottles who goes "WAAAAAARRIORS, COME OUT AND PLAY-YAY!" I could really go for a smoked cheese-pig right now. In fairness, it does turn out to be a massive bust. Bobby and Shelley just don't have a knack for the sort of effortless manipulation that Ben Horne does. I bet if you opened the right door at the Great Norther, you'd find a room full of coma patients, all flunkies with head wounds, with all of their insurance payments going right into Ben's pocketbook. Thanks for everybody for sticking with the threads so far, and having such a great discussion! I love Jerry Horne. You don't want to but you can't help it. He's eating in every scene, and not that there's anything wrong with doughnuts but they're so insubstantial--Jerry's food choices fill me with such joy. An entire leg of lamb. A smoked cheese in the shape of a pig that he's eating straight out of his fist (seriously, is Jerry Horne me? I might be Jerry Horne). And his shirts! He has the ugliest shirts but they're just so perfect. And his weird hair. He's like what would have happened if Ben had skipped cotillion classes and never put on a suit. Jerry really is a great character. I really love how the Hornes are so rapaciously hungry for all of the sensual aspects of life. I have really been struck on this rewatch by how terrific Richard Beymer is in this show. He just looks like he's having so much fun with everything, ever as his storyline wades into total ridiculousness this season. 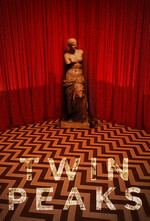 He's a terrific photographer as well -- his photos from the set of Twin Peaks are as visually striking as anything that actually appeared in the show. I noticed that when I rewatched it recently. He's also in the Twin peaks parody that Psyche did. Harold maintained his relationship with the show much longer than I realized.